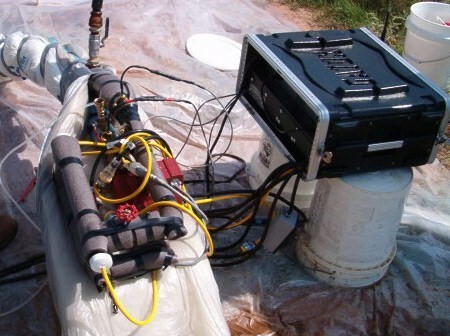 Ewbank performed the first in-situ (in-place) thermal conductivity test for the ground source industry in December of 1994 and today continues leading in this technology and assisting owners, architects and engineers in the design and installation of ground heat exchangers. Ewbank works with independent test providers. The provider conducts the field testing and data acquistion and sends that data set to Ewbank which provids the report and analysis of the tested vertical heat exchanger. Ground source heat pumps connect nature's friendly ground temperatures to your facility or home. Let us help you understand how the earth is ready, willing and able to provide free energy, create your own utility service, and how to size your systems to get the most efficient energy transfer possible for your facility. Moving heat with a ground heat exchanger is truly sustainable. Unlike using energy or power to convert and or to move heat, a GHEX moves heat directly at zero marginal costs. Our experienced staff and test providers can help you put the earth to work efficiently. Copyright © 2004-2018, Garen N. Ewbank and Ewbank Geo Testing, LLC. All rights reserved.